I always hated how our dogs didn't have one station for sleeping, finding their toys, and storing their leashes (and general equipment like brushes, nail clippers, etc.). I also didn't like how their beds would slips all over our hardwood floors. My partner and I didn't just want just any old frame for dogs beds. We wanted a piece of furniture with a modern look that would fit with the rest of our furniture in the house. Anyway, this is what I came up with. I used a waterproof foam mattress (usually for infants) as a starting point. It's depth and width would allow both of the dogs to lay on it comfortably. Because it's waterproof, we only need to wash the sheet every once in a while. 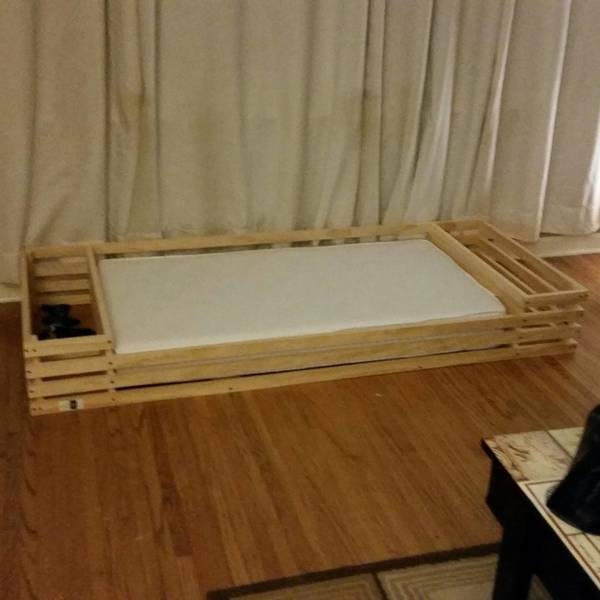 With those dimensions, I built up the frame around the mattress, installed slats for support, and stained it all with a mixture of dark walnut and just a splash of mineral spirits. As a final touch, I cut lids for the side storage compartments and attached some stainless steel wide handles. With the leftover 1in x 2in scraps, I cut some inside shelves for the lips to rest on. Voila...a modern dog bed that we're happy to keep in the living room. I believe there are smaller foam mattresses with vinyl covers as well, so I'll probably make a single-sleeper one with the same style for our bedroom. The vinyl cover and the crib sheet are great though. Easy to keep clean, and it adds some versatility. (These are quite long--six feet total--so bear that in mind if you decide to make one.) The biggest challenge was measuring equal gaps between each 1in x 2in around the outside and then keeping each layer level, so make sure you take your time. I always hated how our dogs didn't have one station for sleeping, finding their toys, and storing their leashes (and general equipment like brushes, nail clippers, etc.). 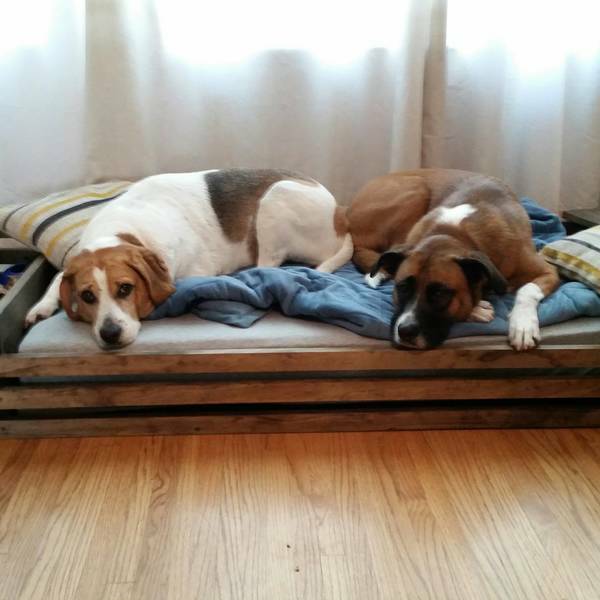 I also didn't like how their beds would slips all over our hardwood floors. My partner and I didn't just want just any old frame for dogs beds. We wanted a piece of furniture with a modern look that would fit with the rest of our furniture in the house. Anyway, this is what I came up with. I used a waterproof foam mattress (usually for infants) as a starting point. 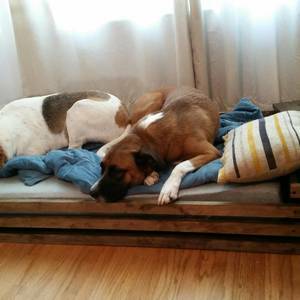 It's depth and width would allow both of the dogs to lay on it comfortably. Because it's waterproof, we only need to wash the sheet every once in a while. With those dimensions, I built up the frame around the mattress, installed slats for support, and stained it all with a mixture of dark walnut and just a splash of mineral spirits. As a final touch, I cut lids for the side storage compartments and attached some stainless steel wide handles. With the leftover 1in x 2in scraps, I cut some inside shelves for the lips to rest on. 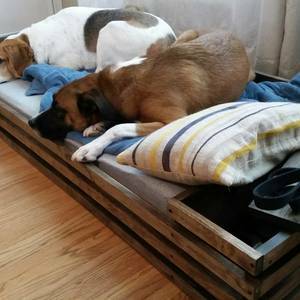 Voila...a modern dog bed that we're happy to keep in the living room. I believe there are smaller foam mattresses with vinyl covers as well, so I'll probably make a single-sleeper one with the same style for our bedroom. The vinyl cover and the crib sheet are great though. Easy to keep clean, and it adds some versatility. (These are quite long--six feet total--so bear that in mind if you decide to make one.) The biggest challenge was measuring equal gaps between each 1in x 2in around the outside and then keeping each layer level, so make sure you take your time.